Sharp Objects cuts deeply into the show's protaganist Camille's character, but falls fairly short on cutting through the others. HBO’s adaptation of ‘Sharp Objects’ has its legs rooted firmly in Gillian Flynn’s 2006 debut novel of the same name with a slight exception - the book rarely delves that deeply into Camille's (Amy Adams) relationship with her dead sister Marian (Lulu Wilson). Perhaps that’s where the first episode fell short of amping up the intrigue and the creep level that encapsulates every page of the book. To venture deep into the book will reveal the rest of the well woven plot so we’ll try to keep this as obscure as possible, in other words - no spoilers. Amy Adams attends the premiere of HBO's 'Sharp Objects' at The Cinerama Dome on June 26, 2018 in Los Angeles, California. In a lot of ways, the details in the show reverberates with the book, but the overzealous digression into Camille's past, becomes a constant scrimmage on our interest, which starts to wane as quick as Camille’s story line starts to eclipse the narrative of other characters in the show. The eight-hour mini series begins with two girls -- the younger Camille and her sister Marian - skating home from school, wild and free. They are euphoric as they enter their home, throw away their backpacks, tiptoe through the house, lest they wake up their mother and then go on to find a woman asleep on the bed. Young Camille takes out a paperclip and is about to slice open the women’s hand when the woman wakes up. It is then revealed that the older Camille is having disturbing dreams about herself. The dreams are a testament to the scars - physical and emotional - she still harbors as an adult. While the flashbacks is designed as a harbinger of the close bond between the two sisters and provides an insight into the devastating loss that had Camille spiral out of control as a child, it also forces the show to slowly trudge through the scenes involving Camille and Marian - courtesy of the constant flashbacks - and quickly shift through the plots involving other characters, who are quite interesting in their own right, if the book is anything to go by. 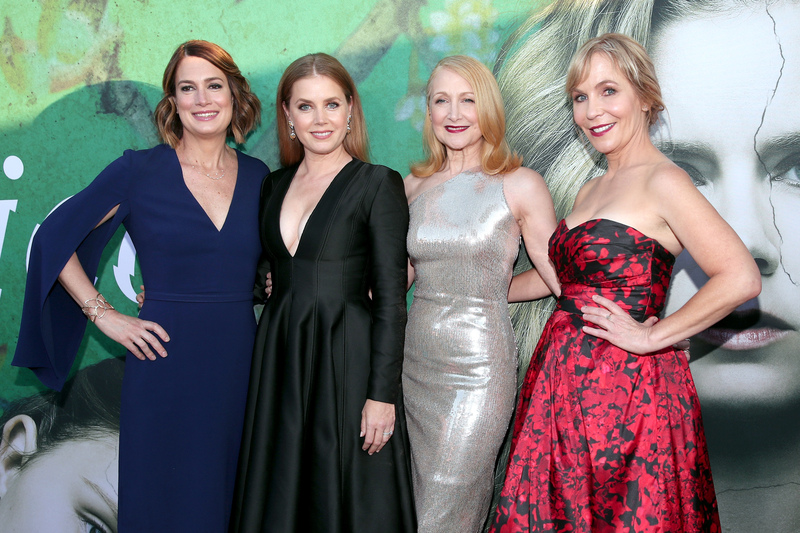 (L-R) Executive Producer/Author Gillian Flynn, Amy Adams, Patricia Clarkson, and Executive Producer/Creator Marti Noxon attend the premiere of HBO's 'Sharp Objects' at The Cinerama Dome on June 26, 2018 in Los Angeles, California. In all fairness, as per cinematic requirements, the show has to diverge from the book. Movies and show more often than not take liberties and veer towards a plot less travelled by the book. 'Sharp Objects' does defy the norm and sticks closely to the book. Except for the times when the show slowly plods through the story lines about the sisters, most of the aspects of the show, closely follows the book. Be it Camille’s aka the prodigal daughters return to her old town to crack down the mystery of a missing and dead girl, her subtle shots at self deprecation when she calls her editor “trash, from old money.” Camille's mother Adora’s anxiety, her half sister Amma’s obsession with doll houses, they’ve all stayed true to the form of the book. However, while the book does factor in the close bond between the two sisters that laid the cracked foundation for Camille’s character as an adult, it doesn’t scour through her baggage from the past with a fine tooth and comb. In one of the flashbacks, young Camille is lying in the bed with her sister Marian, and spouting nonsensical jargon about the cracks in the ceiling, when quite ill-looking Marian stops breathing and Camille's rushes out of the room screaming for help. In another one of these flashbacks, Marian while playing with Camille's hair, is seen having an existential discourse about ghosts and after life. This sets Camille off, who accuses Marian of being a quitter. Then the stage shifts to a different scene where Camille is walking towards a coffin where Marian's dead body lies. The devastated Camille hovers over her dead sister and proceeds to wipe the lipstick off her sister's lips and is dragged off by her mother and the minister at the funeral home. This is one of the few scenes that isn’t in the book, but despite the oversight, the book gives us significant insight into her character. And the book had the luxury of being 500 pages long, while the slow walk down Camille's memory lane in the show that is merely eight episodes long, does not have the luxury to explore every wiring in Camille’s system. To do that would be to skip over some of the most insidious plots the other characters are built on. Patricia Clarkson attends the premiere of HBO's 'Sharp Objects' at The Cinerama Dome on June 26, 2018 in Los Angeles, California. Camille's half sister Amma and her mother Adora (Patricia Clarkson) are characters who deserve to be dissected with equal zeal that has been bestowed on Camille. Her conversation with her teenage half sister Amma is one of the interesting scenes in the first episode as Amma tells Camille that their mother keeps Marians room the same way it was left when she was alive. She then admits that she misses Marian even though she didn't know her. After Amma questions Camille about the dead sister, she steps forward gives Camille a hug and slowly whispers, “But now we can be sisters,” that made the hair on the back of our neck stand up. While Amy Adams is sublime in the show, the others should be given an equal shot to shine through. 'Sharp Objects' cuts deeply into Camille's character, it falls fairly short on cutting through with the others. Perhaps we’ll see a shift in the next episode.